Acoustic event in our PIT (like a coffee shop on campus). Would want well-known covers to be played & some requests taken. Will be an hour long event, you can take breaks as needed as long as a playlist is played during breaks. It will be a college crowd. Acoustic. Electric. Steel. Flamenco. Bass. What do all of these words have in common?! They are all types of guitars of course! Want some serenading background music at your dinner event? 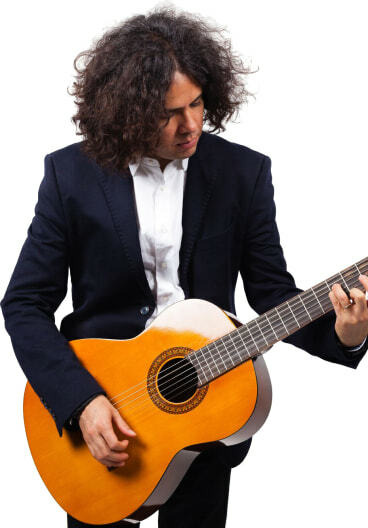 Book a classical or acoustic guitarist. How about an extra guitarist for your rock band? Why then you'll need to hire an electric or bass guitarist in this case. Do your Flamenco dancers need some music to dance too? Well then get a Flamenco guitarist! No matter your event there is a guitar for that. So book the perfect guitarist for your event right here on GigSalad! Search for Guitarists in Waukesha, Wisconsin above. Please note that these Guitarists may also travel to Pewaukee, Elm Grove, Big Bend, Genesee Depot, Wales, Hales Corners, Delafield, North Prairie, Sussex, Mukwonago, Hartland, Lisbon, Butler, Lannon, Merton, Dousman, Greendale, Nashotah, Wind Lake, North Lake, Okauchee, Colgate, Waterford, Eagle, Oconomowoc, Hubertus, East Troy, Brown Deer, Raymond, and Glendale.